Uppsala, Sweden—November 7, 2013—Today, IAR Systems® releases new starter kits for the high-performance STM32F429 series from STMicroelectronics. Several kits are available, all providing hardware, example projects and evaluation versions of the leading embedded development toolchain IAR Embedded Workbench® for ARM®. The kits can be used to evaluate the tools and the included microcontroller, as well as to design, start develop, integrate and test applications. STMicroelectronics’ STM32F429 series is based on a high-performance ARM Cortex™-M4 core and features a rich set of peripherals for connectivity, graphics and audio. The series is designed for medical, industrial and consumer applications where a high level of integration and peripherals are required. 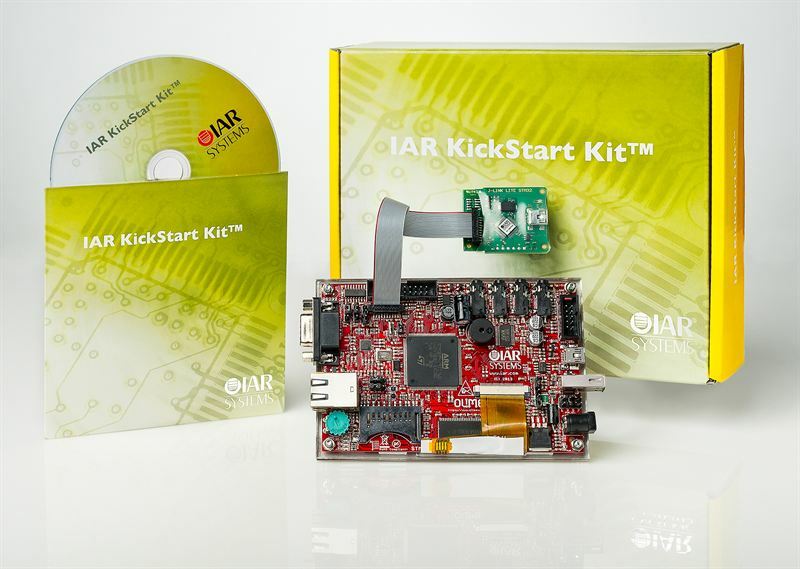 IAR KickStart Kit™ for STM32F429 contains software and example projects, as well as a feature-rich evaluation board with plenty of connectivity possibilities. The board features an LCD touch screen, microphone and headphone connectors, Ethernet, USB OTG and USB Host connectors. Also included is SPI flash memory, an SD card slot and multiple power supply options. The included J-Link Lite debug probe provides JTAG and SWD debug interfaces. For enhanced debug capabilities, IAR Systems also offers a range of fully integrated in-circuit debugging probes sold separately. I-jet™ provides an exceptionally fast debugging platform and has the capability of measuring target power consumption with a high degree of accuracy. Detailed current and voltage measurements can be added by I-scope™. Advanced trace functionality is provided by JTAGjet™-Trace. Also available for the new series are two IAR Experiment! kits: a magnetometer kit and a game controller kit. Both kits include example projects, evaluation versions of IAR Embedded Workbench for ARM and an STM32F429 evaluation board. The magnetometer kit can be used to identify magnetic fields with the included magnetometer module and to output information on a small LCD. The game controller kit features a game controller and a color LCD. The kits can optionally also include a J-Link Lite debug probe and is compatible with other JTAG probes such as I-jet. Pricing starts at 69 EUR/94 USD. The kits are in stock and available in IAR Systems’ e-shop. Details are available at www.iar.com/eshop.